The British Newspaper Archive (BNA) has a new title in its database: The LondonDerry Sentinel. So far, all 104 editions published in 1851 and 1852 have been added. In time, the BNA plans to add editions spanning 1829–1872. When first launched, the Sentinel was published weekly, on Saturdays. Over the years it became a bi-weekly but has since reverted to weekly publication. It is now a tabloid published on Wednesdays. 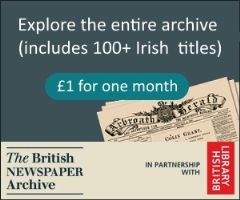 If you haven't already explored the British Newspaper Archive, which now holds more than 100 historical Irish papes and a total of almost 450 English, Scottish and Welsh titles, you may like to take up a special offer: enjoy your first month of access to the entire database for just £1. This offer is valid to the end of the year. To take advantage of this discount (the standard price is £12.95), just click/tap the image above, type the promotion code 1939TRYBNA1FOR1 in the box, and select the monthly subscription option. You'll see the cost change to £1 and can then proceed to the payment page. At the end of your initial 1-month period your subscription will be automatically renewed at the normal price of £12.95. If you don't want the subscription to renew, un-tick the 'auto-renew my subscription’ box in the My Account section of the site.